While the HTC Sensation might be the hottest Android phone headed to T-Mobile this summer, the carrier announced today that it will be adding two inexpensive Samsung Android phones to its lineup. Both phones will be available later this month, but neither T-Mobile nor Samsung gave any specific dates. The more exciting of the two phones, the Samsung Exhibit 4G will ship with Android 2.3, also known as Gingerbread. As the name implies, the Exhibit 4G will support T-Mobile's HSPA+ 4G network. It is powered by a 1GHz processor, which I assume is Samsung's own Hummingbird chip. The Exhibit has a 3.7-inch capacitive touchscreen with a 480-by-800-pixel resolution. From the press images, it looks like it will be running some version of Samsung's proprietary overlay, TouchWiz, on top of Gingerbread. The Exhibit comes equipped with a 3-megapixel camera with flash and a camcorder, as well as a front-facing camera. The camera seems a bit disappointing, but given the price, it isn't all that surprising. The Exhibit 4G will cost $80 after a $50 mail-in rebate with a two-year contract with T-Mobile. The Exhibit will come in violet and black finishes. Aimed at slightly younger users or perhaps first-time smartphone owners, the Samsung Gravity SMART will ship with Android 2.2 and boasts a slide-out full QWERTY keyboard. In addition to the hardware keyboard, the Gravity SMART has a 3.2-inch touch display. And making messaging absolutely pain-free, the Gravity SMART will also come with Swype preinstalled on the touch keyboard to help you type faster. It will also come with a 3-megapixel camera with an LED flash. The Gravity SMART will cost $70 (after a $50 mail-in rebate) with a two-year contract. 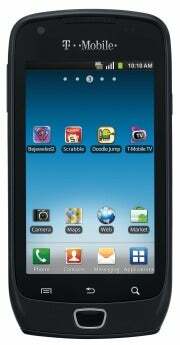 The Gravity SMART comes with Group Text, which we saw on the T-Mobile Sidekick 4G, also made by Samsung. Group Text lets you create, name, manage, and participate in reply-all group text messages. I really liked this feature on the Sidekick so it is nice that a less-expensive T-Mobile phone is getting in on the messaging action as well. We've seen quite a few budget Android phones this summer, like the Samsung Replenish and the Pantech Crossover (which incidentally just arrived in our offices today). Is the tradeoff for less powerful specs worth the lower price? Do these phones have a place in a smartphone world crowded with super phones with 4.3-inch displays and dual-core processors? Personally, I'd rather pay a little extra for a strong camera and a faster processor, but I understand why not everybody needs a power-draining, wallet-busting super phone.